It seems that nowadays everybody (including yours truly) posts everything on facebook. While that’s loads of fun, it does mean that I’ve been blogging there instead of here. I apologize for the hiatus… but if you’re on facebook, join me there! There’s a business page, for Timberwolf Creek, and I have my personal page under my own name for political rants, travel posts, and pictures of my grandkids. And my dog. And my ridiculously handsome husband. So it goes. Meanwhile, I grabbed this photo in the morning and it just sums up All Things Wonderful about living on this beautiful mountain. 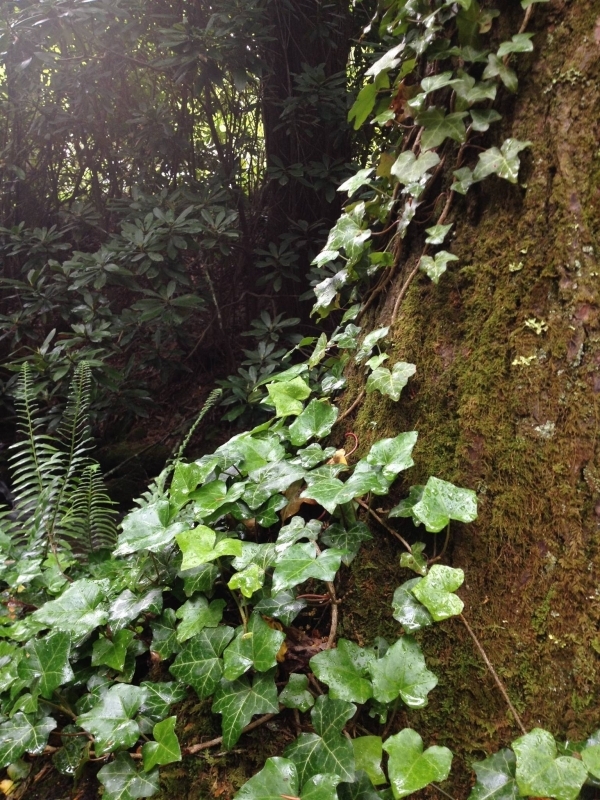 Moss and ivy climbing up the side of an enormous tree, ferns underfoot alongside the tumbling stream, an understory of great rhododendron, promising white bouquets in another couple of weeks… It all combines to make a cool, green, quiet space, for retreat, reflection, renewal. You can *breathe* here. This entry was written by The Wedding Fairygodmother, posted on June 23, 2016 at 8:21 am, filed under bed and breakfast, garden, smoky mountains, Travel and tagged B&B, bed and breakfast, destination wedding, gardens, maggie valley, married outside, mountain B&B, mountain cabin, mountain wedding, North Carolina mountains, outdoor wedding, smoky mountain wedding, smoky mountain wedding chapel, smoky mountains, wedding elopement. Bookmark the permalink. Follow any comments here with the RSS feed for this post. Both comments and trackbacks are currently closed.